​Bradleys Head Rd, Mosman, a short walk downhill from the main Taronga Zoo entrance. The symposium will be held in the Harbourview Ballroom. A ferry departs from Circular Quay every 30 minutes. A ferry timetable can be viewed here. Cost is around $5.84 each way, payable via Opal Card. The Zoo Express departs daily from Darling Harbour Pier 26 and Circular Quay. There's also an all day hop on, hop off option. For more information visit http://www.captaincook.com.au/sydney-harbour-cruises or call (02) 9206 1111. The 24 Hour Hop On Hop Off departs daily from Darling Harbour, Manly Pier 26, Manly and Circular Quay. For more information visit https://www.captaincook.com.au/sydney-harbour-cruises/hop-on-hop-off/24-hour-pass-and-taronga-zoo/ or call (02) 9206 1111. Hop on, hop off services across the harbour. Puchase tickets onboard at Manly Wharf or Circular Quay. For more information visit http://www.sydneyharbourecohopper.com.au/ or call (02) 9583 1199. 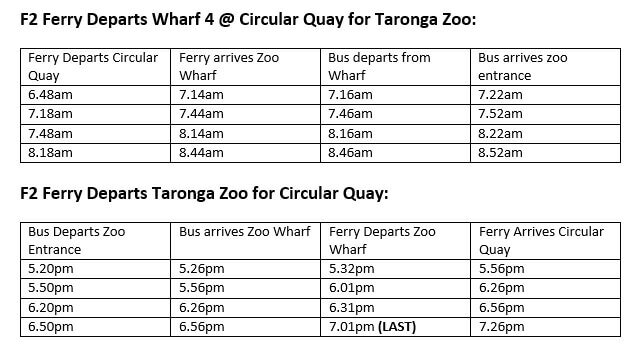 The Taronga Zoo shuttle departs twice daily from either Darling Harbour, (King Street Wharf #8) or Circular Quay (Eastern Pontoon). For more information visit http://www.fantasea.com.au/taronga-zoo-shuttle or call (02) 9556 9200. Once you arrive at the Taronga Zoo wharf, a public bus will deliver you to the zoo's front entrance. The route M30 Metro Bus departs Central Station (Stand B on Eddy Avenue), Town Hall Station (Stand K, Park Street), Wynyard Station (Stand T, Clarence Street) and travels to Taronga Zoo every 10 to 15 minutes. The journey from the city over the Harbour Bridge takes approximately 30 to 45 minutes depending on traffic. Visit transportnsw.info for the route planner. From Chatswood Interchange - Stand J take the 257 via Victoria Ave, Penshurst Street, Willoughby Road, Pacific Highway, Falcon Street and Military Road. Change at Mosman Junction and take the M30 via Military Road and Bradleys Head Road to Taronga Zoo. Find your way to Military Road in Mosman. At the roundabout, take the second exit on to Bradleys Head Road and continue 1.3km before arriving at Taronga Zoo. Follow the M2 Motorway and continue on to the Lane Cove Tunnel, making a slight right at the Gore Hill Freeway. Continue on to the Warringah Freeway before exiting on the right on to the Military Road exit. Continue on to Military Road, later turning right to stay on Military Road in Mosman. At the roundabout, take the second exit on to Bradleys Head Road and continue 1.3km before arriving at Taronga Zoo. Follow the M5 South West Way Motorway, merging on to General Holmes Drive. Take a slight left at the Eastern Distributor and continue onto the Cahill Expressway and continuing further on to the Sydney Harbour Tunnel. Continue on to the Warringah Freeway and exit right on to Falcon Street, continuing onto Military Road, later turning right to stay on Military Road in Mosman. At the roundabout, take the second exit onto Bradleys Head Road and continue 1.3km before arriving at Taronga Zoo. Parking is available at the Zoo. Entry to the car park is from Bradleys Head Road. The car park day rate is $18.